Before I say the word “NEVER”, I really should remind myself that for me it’s like setting myself a new challenge without wanting to. You may remember towards the end of last year my blog post on my experience of running 26.2 miles in New York… it wasn’t a very pretty post and I’m sure it had the word NEVER in it a few times. Well you might have already guessed it, my NEVER now has a date, time and place. Sunday 24th September 2017 in Berlin. Yes that is correct, I am signed up for Berlin Marathon – eekk! In fact, I’ve not just decided to run Berlin. My plan is to run Boston in April 2018, Chicago in October 2018, Tokyo in February 2019 and London in April 2019. If you are not an avid marathon supporter, you may be wondering why I have picked these cities around the world to run a marathon in. They’re not the cheapest or most picturesque, they’re not the most extreme or easiest. 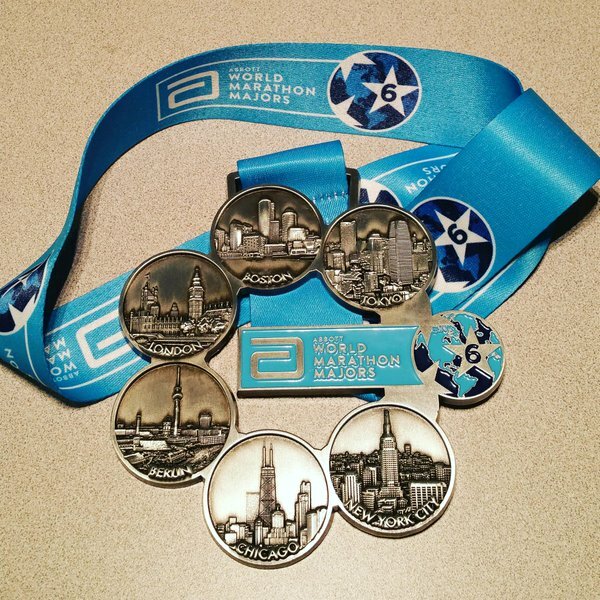 They are however the Abbott’s World Marathon Major locations and I want that bling! So I’ve made some decisions. I’m not going to over analyse ever single detail and convince myself I’m totally prepared. Running 26.2 miles is not easy for anyone and the training is pretty tedious. By looking at the improvements I’ve made to my running already, I’ve noticed a few things. The more I run the more my body gets used to it – therefore I am going to do a few more longer runs. The more I cross train and strengthen the muscles I need to support my running, the less it hurts – therefore my TRX is going to be my best friend. The more I view food as fuel and eat accordingly, the less crap I feel when I run – therefore I am going to make sure it gets premium nutrition. I know there are lots of people out there blogging about nutrition and running, but I thought it might be fun to do it from a complete amateurs perspective. So what do you think? Would you like to learn with me? You never know, I might convince you that if I can do it, anyone can.